This was the encouragement and hope that led the first meeting on April 29, 2004, of Minnesota metro-area immersion parent leaders, later to be established as MAIN Parents. As immersion practitioners and researchers often recognize, it is largely the energy and commitment of parents that leads to the initiation and success of language immersion education. MAIN Parents was created by a desire to connect parents of children with similar educational circumstances, goals and obstacles. It was inspired by the Minnesota Advocates for Immersion Network (MAIN), an organization that includes immersion administrators, specialists and teachers. The goals of MAIN Parents mirror those of MAIN: encouraging and supporting discussion, collaborative problem-solving, pooling of resources, sharing successful school initiatives, and advocating for immersion education at all levels of administration. MAIN Parents was initially organized in April 2004 by Park Spanish Immersion School Site Council Chair through individual phone calls to Site Council and PTO/PTA Chairs of neighboring immersion schools. The response for participation was overwhelming and eager. There were representatives from six schools. Each school was asked to bring a variety of school brochures, newsletters, and programs to be shared. The first meeting was dynamic and filled with possibilities as ideas flowed freely. The group quickly organized itself to meet monthly, using a shared-leadership style in which all schools take turn hosting as well as creating the agenda. Topics and issues discussed over the past year and a half have been: Fund Raising, Volunteerism, Immersion Classroom Assistant Programs, Parent Leadership Groups such as Site Councils and PTO/PTA, All-School Events, PTO/PTA Meeting Topics, and Relationship Building within our respective school districts. We found that the discussion topics and issues selected were relevant across the board, not only to a particular school, and so the group problem solving and growth began. Each school has been invited to send a parent representative who has expertise on the agenda topic. As the meetings have progressed, we’ve learned that each school has at least one if not several strong initiatives underway. The agenda topics have also been especially helpful to newly organized immersion schools providing a starting place and resource for ideas. At our May 2005 meeting, MAIN Parents invited the director of Immersion Projects for the Center for Advanced Research on Language Acquisition (CARLA) at the University of Minnesota, Dr. Tara Fortune, to advise the group on the broader goals of immersion education and to learn what role MAIN Parents might play in this effort. 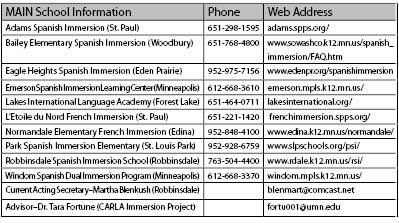 Current legislative action regarding immersion education was reviewed including mobilization efforts toward securing a world language coordinator at the State Department of Education and how this could affect language learning in Minnesota. Also discussed was increasing effective communication within the immersion community statewide with the purpose of assisting new programs, creating a ‘think tank’ for problem-solving strategies, and most importantly, establishing a unified immersion voice to best meet the needs of successful immersion education, such as funding, staffing and public awareness. In the current climate of funding shortages in education, more and more parent volunteers are being called upon to help fill the financial gaps. Parent volunteerism is necessarily on the rise as we have moved beyond bake sales to organizing high levels of funding for qualified immersion classroom assistants, playground equipment, and immersion staff development. By organizing groups such as MAIN Parents, the aim is to make our efforts more efficient. As of the September 2005 meeting the number of participating schools has grown from six to ten. A secretary now records minutes and keeps the roster current at each meeting. The MAIN Parents e-mail roster serves as a method of communication between CARLA to the participating immersion schools and their parent groups. In an effort to maintain stakeholder communication, a parent liaison attends the monthly MAIN meetings. This year’s goals involve the development of a website designed for parents of immersion education to serve as an authoritative resource containing facts and best practices, links to related topics for parents and students, and a listing of cultural events. The group is also working on a mission statement that is in concert with MAIN.